The seven martys (and one other) were captured at the Battle of Rulllion Green and sentenced for execution in Ayr. The eighth Covenanter had to carry out the deed as the public hangman fled to avoid having to do it. They were hanged in Ayr on 27 December 1666. 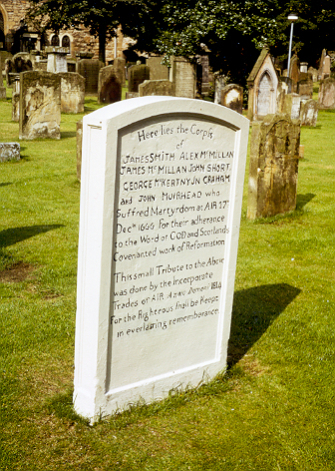 The headstone is located in the old kirkyard of St John's Church, overlooking the River Ayr.